Visit our website at www.dalevillepubliclibrary.com. It is the mission of the Daleville Public Library to serve all the citizens of Daleville and the surrounding communities by offering services, resources, and facilities to fulfill their informational, educational, and recreational needs and interests. The term "citizen" encompasses individuals and groups of every age, education, philosophy, occupation, economic level, ethnic origin, and human condition. We always welcome new patrons and we would like to tell you a few things you will need to know. We have approximately 20,000 fiction, nonfiction, large print and reference books. Also featured in our collection are DVD's, audio books, periodicals, 31 adult computers and 6 children computers with access to the Internet and the Alabama Virtual Library (AVL), and free Wi-Fi throughout the Library. We also carry the following newspapers: The Dothan Eagle, USA Today, Daleville Sun-Courier, The Enterprise Ledger, Southern Star, Army Flier, The Sun and The Wiregrass Aviator. The staff of the Daleville Public Library will order books and other items that we do not have in our library through an Interlibrary Loan. There is a $5.00 charge per book or item for this service. The staff will also proctor tests for a $15.00 fee per test. This fee will cover copies, postage, faxing, staff time, etc. All items may be checked out for a two-week period except for reference materials, periodicals, and newspapers. These items are to be enjoyed in the library only. Black and white copies are 20 cents; colored copies are 50 cents (text only); colored copies with picture(s) or picture(s) with text are $1.00. The cost will be doubled for copies printed on front and back of paper. This includes copies mistakenly printed. To use the computers, everyone must sign the Acceptable Use and Internet Safety Policy. Children under 18 must have a parents signature on their forms. There is a 10 cent per day, per item, late fee for items returned after the due date. However, the late fee total will never exceed a maximum $3.00 fine per item. You may call us at (334) 503-9119 to renew your items for another two weeks. We also have a drop box for your convenience for after hours. We ask that you only use the drop box for books. Do not place DVD's, or audio books in the drop box. You will be responsible for any damages to DVD's or audio books dropped in the drop box. 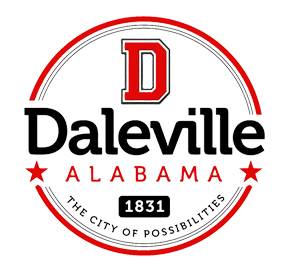 The Daleville Public Library issues free library cards to residents of Daleville, Clayhatchee, Level Plains, and Ft. Rucker. However, if you reside in another city or town, the Library will issue you a free library card if you are affiliated in any way with Daleville or Ft. Rucker, such as working or have children attending schools in these areas. All Library card applicants may apply for, receive a card, and borrow library materials immediately if they present acceptable identification showing current residential address. Library card applications can be filled out only at the Daleville Public Library. The signature of a parent or guardian is required on applications for library cards for children under age 16. The parent or guardian is responsible for materials charged to his/her child's library card. Your first library card is free. Replacement cards are $2.00.